Archaeologists stumble on Neolithic ritual site in Suffolk. Diggers laying groundwork for a new windfarm discover previously unknown site of international significance. As diggers began to strip the daisies and buttercups and carve down through the parched clay of a field near Woodbridge in Suffolk that sloped down to a riverbank, with archaeologists watching over the pretty but apparently featureless site, something extraordinary began to emerge. Clear spring water came bubbling from the ground, and with it came massive timbers preserved so perfectly that tool marks were still visible and stake posts were sharply pointed. The archaeologists first thought the timbers must be medieval or even Victorian, and were puzzled to find them so deeply buried. 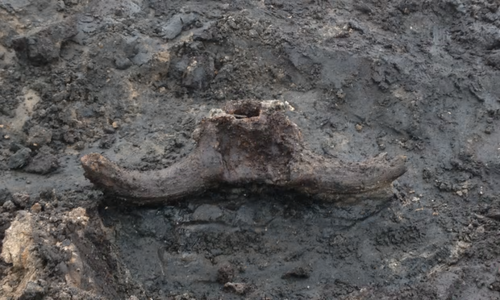 But as 30 metres of timber track were exposed, alongside other unexpected objects too, such as the massive horns and skull of an aurochs, an extinct breed of giant cattle, they realised they were dealing with something far more ancient. The timbers were 4,300 years old, according to the first carbon-14 tests, and underlying ones may be much older. The Neolithic trackway, which had evidence of being repeatedly restored and renewed over decades and probably generations, seems to have led up to a level timber platform, with spring water deliberately channelled to surround it. From the platform, objects were dropped into the running water, including metal, pottery and the horned aurochs skull. The skull had been carefully shaped either to fix to a pole or use as part of a headdress – and as the archaeologists who had to lift and carry it down the hill could testify, lugging it to the site would have taken considerable effort. 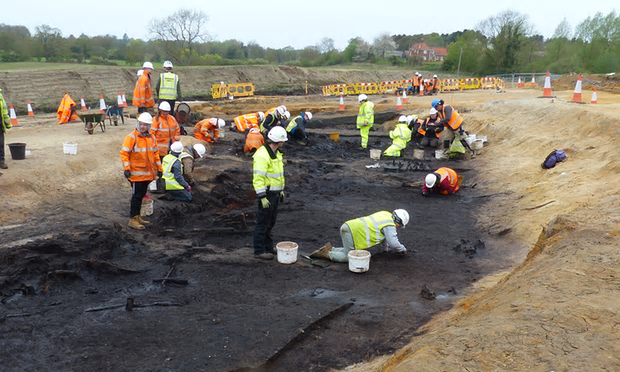 Archaeologists excavate the Suffolk site. Photograph: Scottish Power. The skull was already ancient when it went into the water – tests dated it to about 2,000 years older than the track. Masses of white pebbles that would have been brought specially to the site were also found. Prehistorians and ancient timber experts visited the site, and their opinion and the dating evidence bears out the realisation that the archaeologists had stumbled upon a major site of which not a trace remained in the historical record, despite evidence of Roman, Saxon and medieval occupation of the site. They now realise they did not pay enough attention when they were told that the traditional name of the field was Seven Springs. 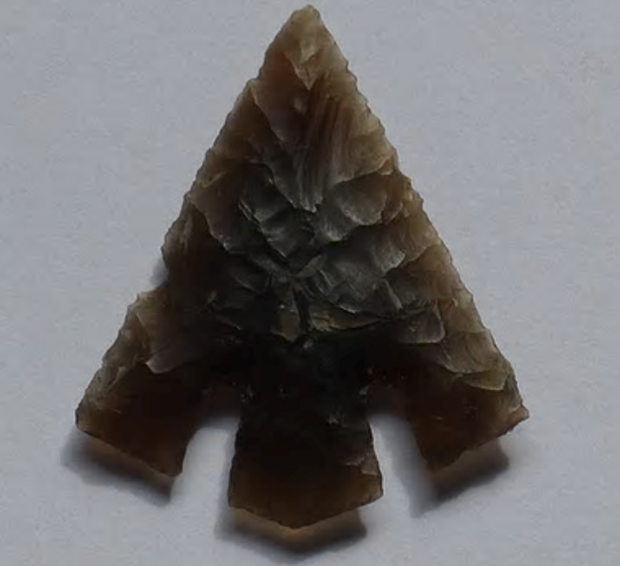 Tanged arrow head discovered at the site. Photograph: Scottish Power. When the timber trackway was originally laid, the site had already been important for 500 years. A causewayed enclosure with a bank sheltering the slope and its springs is probably early Neolithic, built around 4,800 years ago. This was then reinforced by a later Neolithic ring ditch, which was then enclosed by a bronze age enclosure, which was then itself enclosed by an early iron age ditch. The archaeologists found Roman ditches clipping the edge of the site, and traces of Saxon buildings, but the site remained almost unchanged for centuries until the slope was filled and levelled around the 11th century – which had the effect of burying the springs level and preserving the timbers. The aurochs skull in situ. Photograph: Scottish Power. 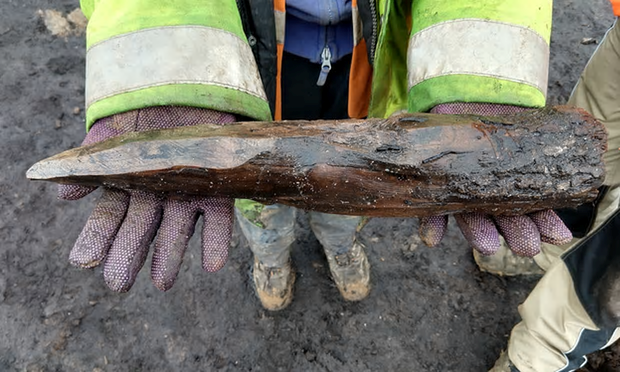 Kate Batt of Suffolk county council archaeological service said the artefacts and major timbers have now been removed for further study, but it is hoped that part of the trackway will eventually be displayed in a local museum. What did neolithic workers eat after a hard day at Stonehenge? The site was the very last in a massive project creating the land base and power lines for a £2.5bn Scottish Power Renewables offshore windfarm, East Anglia One. More than 400 archaeologists from many different units had worked on 50 sites along the 37km line. Scanty records suggested the field had never been anything more interesting than rough pasture, and the archaeologists were surprised and pleased to find evidence of a 17th-century roadside tavern where bullets had been fired into a stone fireplace on some rowdy night. Then the diggers peeled back another 4,000 years.